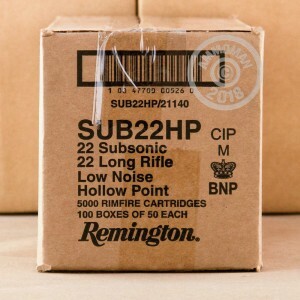 Ten bricks of .22LR (that's 5,000 rounds in packs of 500) will keep you busy for a while. 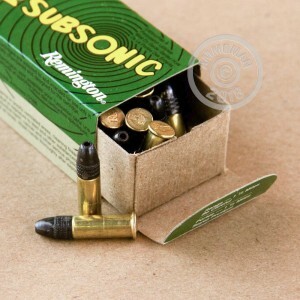 This Remington subsonic ammo will keep noise levels a bit lower while still providing great accuracy, particularly in pistols. These rounds use rimfire primed brass and a light 38 grain lead hollow point bullet suitable for target practice or varminting. 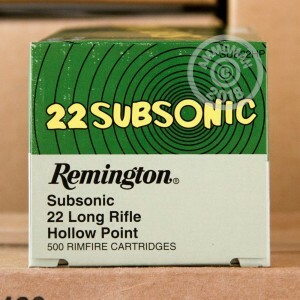 Remington ammo is manufactured at the company's Lonoke, Arkansas facility. As you can imagine, shipping 5,000 rounds of ammo won't be cheap. But we've got you covered--all orders over $99 from AmmoMan.com ship for free. Our shipping costs are built into the list price for maximum transparency so you know what you're paying up front on every page.